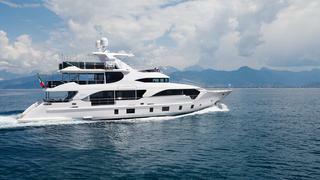 The 32.97 metre motor yacht My Paradis, listed for sale with Master Brokerage, has been sold with Gianni Ricciardi at Forward Yachts and Jeanbattiste Guerini at Velmar acting for the buyer. Built in GRP by Italian yard Benetti to a design by Stefano Righini and RINA classed, My Paradis was delivered in 2014 as the first hybrid propulsion yacht in the yard’s Tradition Supreme range. Décor throughout has bleached pickled oak on the ceilings, bulkheads and furniture with flooring in Tay wood and accommodation is for 12 guests in five cabins. These consist of a master suite, two VIP suites and two twins, each with a Pullman berth. All cabins have entertainment centres, Samsung flat screen televisions and en suite bathroom facilities. The expansive main saloon has two freestanding sofas facing each other to port and starboard, two leather armchairs, a buffet bar for casual dining and an entertainment centre including a 60 inch television screen on a rise and fall mechanism. Forward is a formal dining area for 10 guests. Outdoor areas include an aft deck with a fixed dining table and seating for 10 guests on a built in transom settee and spare chairs. Upstairs, the sky lounge has extra large windows and an L-shaped settee to starboard facing a pop up television to port. Aft of the skylounge, the boat deck has al fresco dining for 10 to 12 guests around an expandable dining table, a wet bar with stools and an L-shaped settee facing aft. There is more al fresco space on the flybridge, featuring seating, sun loungers, a Jacuzzi spa and a retractable sun awning. Twin 985hp MAN engines give her a cruising speed of 13.5 knots and a range of 2,300 nautical miles. MyParadis was asking €8.8 million.